This is pre-registration for the civilian population role-players. Civilians wear NO camouflage or solid uniform items, NO plaid shirts, and NO military-type equipment. Civilian clothes only… no plaid. To help present a more immersive experience, we are trying to have a larger group of civilian role-players for Amerika 9. Certainly the civilian population would be far larger in reality, so some specific rules will be in effect to help maintain game balance with this smaller role-player population. You will be portraying members of the civilian population, possibly playing more than one role through the day. Not all civilians are supportive of the Resistance. Many are loyal citizens of the Reich, who may have personally served in the military or police, or have relatives who serve. Some may not really like the Reich, but are not willing to become involved in the insurrection. Others don’t care about politics at all and may be engaged in criminal or black market enterprises. We encourage you to develop at least one defined character to role-play, preferably more than one. Consider at least a change of shirts and some personal props if you are changing characters. We will ask civilians to complete Reich identity papers for each individual character you plan to portray and bring them to the game. 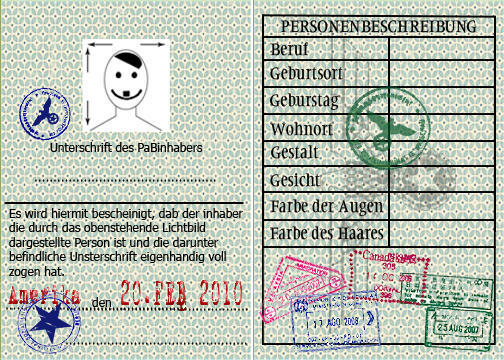 PLEASE PRINT OUT AND COMPLETE YOUR REICHSPAPIEREN! Insert a snapshot of your face in a paint program and fill in the blanks of your paperwork for each character role you intend to run. Most civilians will be unarmed. A few civilians will have legally licensed hunting weapons (shot-guns or bolt-action rifles), or legally licensed hand-guns for a few retired military or police. A few civilians MAY have illegal firearms, if they are in a criminal or black marketer role. We will provide blank “licenses” that actors may complete for any of their portrayed characters with licensed weapons. We do ask that you speak with us about “armed civilian” roles prior to the event as we want to keep these the exception, rather than the rule. A significant percentage of the population are loyal citizens of the Reich. The war ended 70 years ago. Many civilians are loyal to the Reich, some previously served in the Wehrmacht or KriminalPolizei (Kripo) or have relatives who are serving. Some civilians may not be fans of the Reich, but are not about to engage in an active effort to overthrow the government. Some civilians are sympathetic to the Resistance and may be swayed to show greater support if swayed by actions of the combatant forces. A few civilians may have no position on the insurgency against the Reich, but may be criminals engaged in black market activities and are just looking to make money through illegal activities. 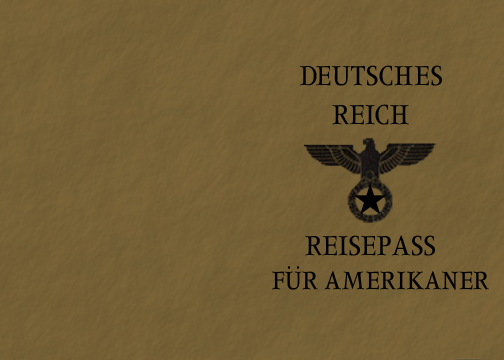 All civilian actors will be asked to develop several character roles they may play through the day, and develop Reich documents for each identity, which may optionally be checked by German forces. 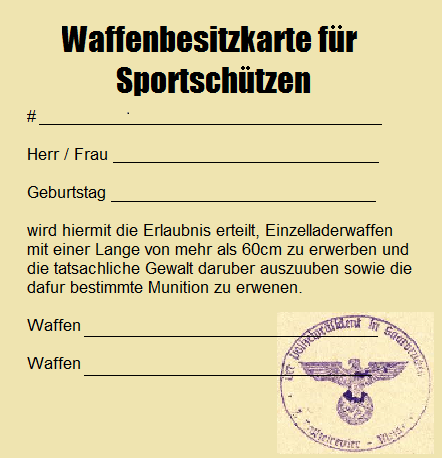 “Trusted” Reich citizens may receive an extra stamp on their documents to notify German players that those individuals have been vetted to some degree and previously demonstrated substantive loyalty to the Reich. Firearms are closely controlled in the civilian population. Civilians which have been legally licensed to own hunting rifles or shotguns will have appropriate documents. Civilian actors engaged in black market activity might have illegal, unlicensed firearms. These will be props for their characters, however – see the next section about civilian violence. We will have some game rules artificiality here to maintain some game balance and minimize combatant player shenanigans. The real-world situational equivalent would have a huge civilian population that we cannot realistically field for the game. We want to stress that MANY civilians are loyal citizens of the Reich, that most individuals motivated enough to choose a side in the fight have already made their move. We do not want German players to suspect that every individual in civilian clothing is planning to stick a knife in their back, and permit both German and Resistance players to speak with civilians and conduct civil affairs interactions with them. Some care should always be exercised as TRUE loyalties may sometimes be hidden, but we want to ensure that players know not every civilian is some sort of double-agent and they’re about to be punked, shot, stabbed, or blown up at any second. Civilians will NOT attack, shoot, knife-kill or otherwise conduct direct violence against any other player. Throughout most of the day, civilian actors portray their roles as non-combatants. Later in the afternoon, some of the civilian actors may have the opportunity to join the Resistance or enlist in the Wehrmacht… but they will put on the appropriate uniforms BEFORE joining a combatant group and conducting offensive actions. While in civilian clothing they will NOT conduct direct violence against other players.